In designing Strategic Doing, we started with a rigorous definition of strategy. We have a strategy when we can answer two questions: Where we going? How will we get there? If a strategy cannot answer these two questions, it’s not really a strategy. So, it’s common that many strategic plans actually failed the test. They do not deliver a strategy. they may outline a set of goals, a vision, a mission. But too often they don’t explain how the strategy will be executed. Strategy is more complex for another reason. Implementation requires collaboration. Executing a strategy typically involves more than one organizational unit. It involves multiple personalities with different agendas. So, the process of executing a strategy is also complex. 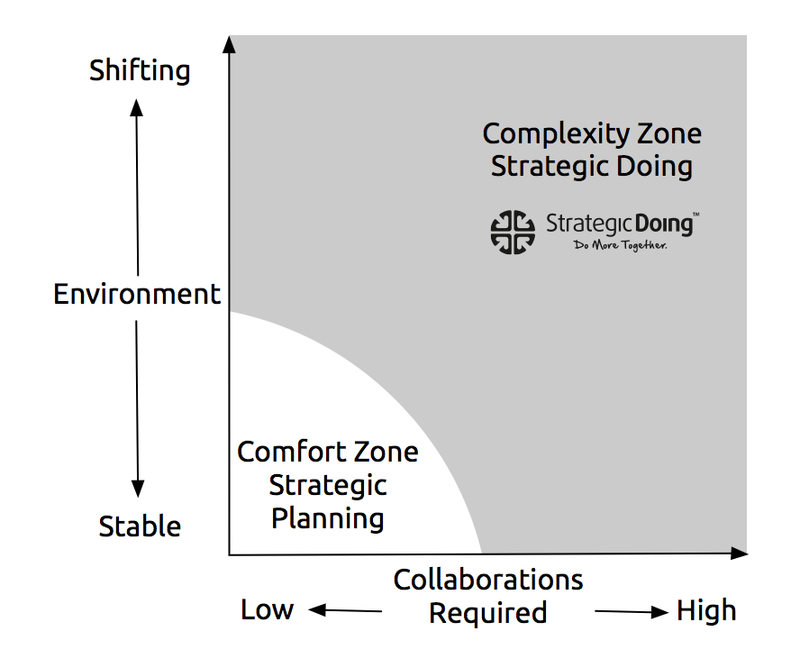 Strategic Doing is designed to deal with both of these dimensions. By continuously updating the strategy – our 30/30 meet ups – we solve the problem of defining clear outcomes that can be shared. We continuously revise our thinking about outcomes as we learn by doing. When it comes to execution, we focus on Pathfinder Projects and clear action plans with deliverables. In this way, we build habits of working together. Trust emerges as we align our words and deeds. So, getting back to our original notion. Strategic Doing is growing because both questions of strategy are becoming far more complex to answer. We’ve come up with a simple discipline that can be mastered with practice. Strategic Doing applies common sense rigorously every step of the way.